Located right around the corner from Southpoint Mall, the current Massey's Chapel building has hosted its United Methodist congregation for the over a century. The simple and elegant wooden structure is designed proportionally around its stock Gothic windows. Besides replacements and repairs done to the walls, the exterior of the building is very nearly in its original form and the interior spaces are all original. Much of the early history of the Massey Chapel congregation is captured in Rev. F.B. Jackson’s “The History of Massey’s Chapel Methodist Episcopal Church, South, to 1931”, originally written to be delivered as a lecture and later published as a pamphlet. Much of Jackson’s narrative relies on the recollections of Pleasant H. Massey, a church member for more than 50 years who is buried in the cemetery behind the chapel. 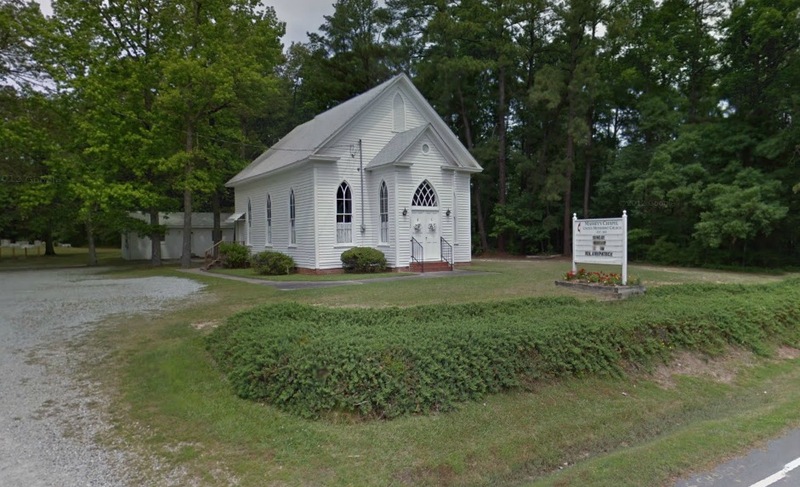 The Massey Chapel church congregation was founded in 1855. A roll dated September 14, 1856 lists John Massey, Elizabeth R. Massey, Emily K. Massey, Tempy Cates, and Catherine Herndon as present, all presumably early or even founding members of the congregation. John and Elizabeth Massey were married, Emily their daughter. The Masseys were farmers and the extended Massey family owned a great deal of land in the vicinity of the chapel. Pleasant H. Massey was the son of John and Elizabeth. Catherine Herndon, around twelve at the time, was a member of the neighboring Herndon family who owned much land to the east of the Masseys. The identity of Tempy (possibly short for Temperance) Cates is more of a mystery and cannot be easily linked to any one person on the census rolls. There is a strong possibility that she was associated with the Cates family of Hillsborough. Church oral history tradition states that one of the original church members was a black woman. It is possible that Tempy Cates may have been that woman but no records can confirm this. Even if she was white it is still feasible that the church tradition is true and the black woman was simply not accounted for in any material records. Further, while it is possible the black member may have been free, given that the congregation was located in the middle of nowhere at the time (there was no Southpoint or Fairfield subdivision, Durham had not even been incorporated as a town yet), it is most likely she was enslaved — either by the Masseys or by another slave owner from whom the Massey’s hired her. “When it was decided to build Massey’s Chapel Church there was no one in sight who could give any material aid except John Massey. He was a poor farmer and had about as much as he thought he could do to maintain his family and live,” the Jackson text reads. Pleasant Trice, “a wealthy slave owner,” gave $25 to Massey to build the church which he constructed on his own land. In the early years, the congregation met once a month and only on weekdays, never Sundays. Due to/with the help of the chapel’s growth in membership, the present structure was constructed in 1900. Annie King, a member of the church her entire life, is largely credited with helping the church gain landmark status from Durham County in 1989, the first property to receive such designation. At 101 years old, King participated in the reveal of the historic plaque placed upon Massey’s Chapel in April 2017. Preservation Durham contributed assistance in the application for a plaque. Congregation members credit the chapel’s historic landmark designation as a tool through which the property has resisted development pressure in recent years.